Egypt (Egyptian Arabic: "مصر" Masr; officially, the Arab Republic of Egypt, Classical Arabic: جمهورية مصر العربية) is a transcontinental country in North Africa and the Middle East with its capital located in its largest city, Cairo. Egypt also extends into Asia by virtue of holding the Sinai Peninsula. 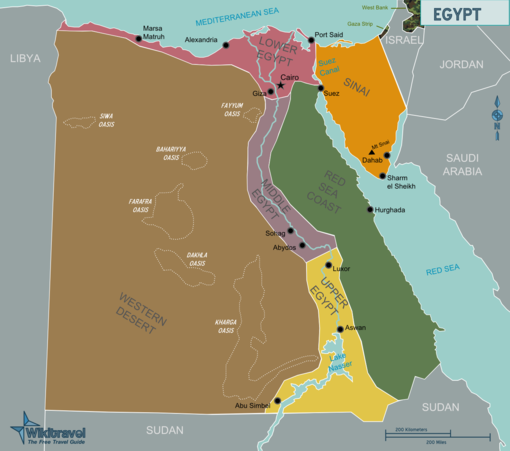 Egypt is bordered by Israel and the Gaza Strip to the north-east, by Sudan to the south and by Libya to the west. The country is bounded by the Mediterranean and Red Seas (to the north and east respectively) and geographically dominated both by the Nile River and its fertile well-watered valley, and by the Eastern and Western deserts. 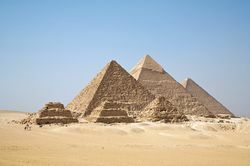 Ever since the 2011 revolution, tourism (which provides about 15% of employment in Egypt, so one-sixth of the population are reliant upon it) has taken a major hit. Because of the downturn in tourism, expect more persistent and aggressive touts, but prices are lower and you can avoid the gigantic crowds that, at other periods, were typically overflowing the marvellous sites. The more recent counter-revolution and Military putsch, like many events of its sort, has brought repression, death sentences and imprisonment for many Egyptians (and foreign journalists) but has resulted in lower crime and reduced disruption for well-heeled foreign tourists. The regularity and richness of the annual Nile River flood, coupled with semi-isolation provided by deserts to the east and west, allowed for the development of one of the world's great civilizations. A unified kingdom arose around 3200 BC and a series of dynasties ruled in Egypt for the next three millennia. The last native dynasty fell to the Persians in 341 BC, who in turn were replaced by the Greeks, Romans, and Byzantines. It was the Arabs who introduced Islam and the Arabic language in the 7th century and who ruled for the next six centuries. A local military caste, the Mamluks, took control about 1250 and continued to govern after the conquest of Egypt by the Ottoman Turks in 1517. Following the completion of the Suez Canal in 1869, Egypt became an important world transportation hub, but also fell heavily into debt. Ostensibly to protect its investments, Britain seized control of Egypt's government in 1882, but nominal allegiance to the Ottoman Empire continued until 1914. Partially independent from the UK in 1922, Egypt acquired full sovereignty following World War II. The completion of the Aswan High Dam in 1971 and the resultant Lake Nasser have altered the time-honoured place of the Nile River in agriculture and the ecology of Egypt. A rapidly growing population (the largest in the Arab world), limited arable land, and dependence on the Nile all continue to overtax resources and stress society. The government has struggled to prepare the economy for the new millennium through economic reform and massive investment in communications and physical infrastructure. Egypt is largely a desert, an extension of the great Sahara that bands North Africa. Save for the thin strip of watered land along the Nile River broadening into the Nile delta, very little could survive here. As the ancient Greek historian Herodotus stated: "Egypt is the gift of the Nile". The climate, however, does vary a little bit depending on where you are in the country. On the north coast along the Mediterranean Sea, a thin strip of land stretching from the sea to 50km southwards receives some of the most heavy rain in the country during winter months. Thunderstorms along with heavy rain showers that often last several hours are not uncommon here such as in Alexandria, Marsa Matruh and all other coastal areas, and even the Delta. In some years the rainstorms can last for a whole day or so, though the rain tends to be less heavy. Hail is also not uncommon, especially out in the desert where the weather is usually colder and allows for ice to fall and even frost to form on non-rainy days. In the Sinai Mountains and also the Red Sea mountains, which stretch along the east side of the country along the shore of the Red Sea, there is generally more rain as rain clouds tend to develop when warm air evaporates and rises as it moves across higher terrain. Floods in these areas are a common weather phenomenon as so much rain can fall in a very short amount of time (often a day or two), with thunder and lightning as well. Because of the desert and lack of abundant vegetation, the water from the rain quickly falls down across the hills and mountains and floods local areas. In fact, every year there are stories in the local newspapers about flash floods in areas of the Sinai and also in Upper Egypt (southern Egypt) such as in Assiut, Luxor, Aswan, Sohag, etc. These floods, however, only generally happen two or three times a year, and often do not happen at all in some years, depending on the weather. When they happen though, it is often in early times of the season such as in September, October or late winter such as February or March (often the rainiest season in Egypt). Thus, one should be careful when venturing out into the desert or camping in certain areas as water can suddenly rush down from the nearby mountains and hills. It can sometimes carry a quite strong current that has been known to break down homes of rural people who build their homes from mud, bricks, and other weak materials. It is not surprising to hear that some people drown in the floods, which is strange for a desert country that doesn't receive much precipitation. Ramadan is the ninth month of the Islamic calendar and the most important month in the Islamic Calendar for Muslims, the majority religion in Egypt. Commemorating the time when God revealed the Qur'an to Mohammed, during this holy month, Muslims abstain from eating, drinking or smoking until after sundown on each day. Although strict adherence to Ramadan is for Muslims only, some Muslims appreciate that non-Muslims do not take meals or smoke in public places. During Ramadan, many restaurants and cafés won't open until after sundown. Public transport is less frequent, shops close earlier before sunset and the pace of life (especially business) is generally slow. As expected, exactly at sunset minute, the entire country quiets down and busy itself with the main meal of the day (iftar or breaking-fast) that are almost always done as social events in large groups of friends. Many richer people offer (Tables of the Gracious God موائد الرحمن ) in Cairo's streets that cater full-meals for free for the passers-by, the poorer ones or workers who couldn't leave their shifts at the time. Prayers become popular 'social' events that some like to enrich with special food treats before and after. An hour or two later, an astonishing springing to life of the cities takes place. Streets sometimes richly decorated for the whole month have continuous rush hours till very early in the morning. Some shops and cafés make the biggest chunk of their annual profit at this time of year. Costs of advertising on television and radio soars for this period and entertainment performances are at their peak. Egypt consists of a vast desert plateau interrupted by the Nile valley and delta, along with the Sinai peninsula. Portions of the Nile River valley are bounded by steep rocky cliffs, while the banks are relatively flat in other areas, allowing for agricultural production. Abu Simbel with the Great Temple of Ramesses II (left) and Small Temple of Nefertari (right). eVisa - The Egypt e-Visa is a new electronic travel authorization system for citizens of eligible countries wishing to travel to Egypt for tourism. Beware of scam websites such as egyptvisa.com that may not even issue visas and jst disappear with your money. Citizens of many countries may obtain a one month single entry visa on arrival at major points of entry. (Note that you are NOT eligible for this visa if you happen to have an Official or Diplomatic passport, it is only for ordinary passport holders.) A USD25 fee is demanded on arrival. It is advisable to pay the fee in US dollars and in the exact amount as otherwise your currency will be exchanged for Egyptian pounds which will only then be exchanged into US dollars with double conversion fees. Change will be given in Egyptian pounds (EGP). At airports, you must obtain these from a bank office before passport control; however, you will have no problem obtaining one. Check with your nearest Egyptian Consular mission for more details concerning visa regulations applying to your citizenship. Citizens of the following countries can obtain visa upon arrival at any of the Egyptian ports of entry: Croatia, Georgia, Germany, Japan, New Zealand, Norway, Macedonia, Republic of Korea, Russian Federation, Serbia, Ukraine. Citizens of Bahrain, Guinea, South Korea, Libya, Oman, Saudi Arabia, Sudan, United Arab Emirates and Yemen receive a 3 month visa on arrival. Citizens of Kuwait can obtain 6-month Residence Permit upon arrival. China and Malaysian citizens receive a 15 day visa on arrival. Citizens of China (only Hong Kong and Macau SAR) may have a 30 day visit without visa. Afghanistan, Algeria, Armenia, Azerbaijan, Bangladesh, Bosnia-Herzegovina, India, Indonesia, Iraq, Iran, Israel, Kazakhstan, Kyrgyzstan, Lebanon, Malaysia (if you intend to stay for more than 15 days), Moldova, Montenegro, Morocco, Pakistan, Palestine, the Philippines, Sri Lanka, Tajikistan, Thailand, Tunisia, Turkmenistan, Turkey, Uzbekistan, Vietnam and all African countries (except citizens of Sudan, Guinea, and Libya, who do not require visa). Visitors entering Egypt at the overland border crossing at Taba or at Sharm el Sheikh airport can be exempted from a visa and granted a free fourteen day entry visa to visit the Aqaba coast of the Sinai peninsula, including Sharm el Sheikh, Dahab and St. Catherine's Monastery. Visitors wishing to leave the Sinai peninsula and to visit Cairo and other Egyptian cities are required to hold full Egyptian visas, although strictly speaking there is a small possibility no one will check for this unless you attempt to exit the country. These are not issued at the Taba border crossing and must be acquired in advance either in the country of residence, at the Egyptian consulate in Eilat or airport upon arrival. Visitors travelling on organized tours often may be able to have their visas issued at the border, but you should verify in advance with their travel agent or tour operator if this option is available to them. Those in possession of a residence permit in Egypt are not required to obtain an entry visa if they leave the country and return to it within the validity of their residence permit or within six months, whichever period is less. Tourists visiting Sharm-el-Sheikh who are planning to undertake scuba diving outside local areas (eg Ras Mohammed) will need to obtain the tourist visa, because this technically means leaving the Sharm-el-Sheikh area and leads to the requirement for a visa. Officials on boats may check dive boats whilst on the waters so you are advised to obtain the visa beforehand: there may be fines involved for you and the boat captain if you are caught without the appropriate visa. Most reputable dive centres will ask to see your visa before allowing you on trips. Egypt has peaceful relations with Israel, and travelers with passport stamps indicative of entry to Israel will not encounter any issues at the border. Direct flights between Tel Aviv and Cairo are available. Cairo International Airport — the primary entry point and the hub of the national carrier Egyptair. Ferries run regularly from Aqaba across to Nuweiba on the Sinai peninsula, bypassing Israel and the sometimes complicated border arrangements. Generally there is no visa fee for entering Jordan through Aqaba since it is a part of the free trade zone. The line to Nuweiba is operated by ABMaritime. A weekly ferry also runs between Wadi Halfa in Sudan and Aswan. Ferry boats also ply between the Red Sea coast to ports in Saudi Arabia and Jordan. Travellers can easily access Egypt by bus from Israel from the bus stations in Jerusalem and Tel Aviv. You will take a bus to Eilat where you can cross over the border into Taba and take a bus to Cairo or into the Sinai. The Jordanian state bus company, JETT, also operates a direct bus between Amman and Cairo which leaves at 03:00 from the JETT terminal in Amman and takes approximately 19 hours to reach Cairo. Generally, only two or three buses leave from Taba to the various destinations each day: one in the morning and one in the afternoon and sometimes one in the early evening. You should plan your arrival by bus in Eilat accordingly, and be prepared to spend the night in either Eilat or Taba if you will arrive in the evening. All foreigners must pay a EGP 129 tax at a small office after the bus leaves the station. Also, be aware that all of the routes by bus must by necessity cross Israel; keep this in mind if you plan on further to travel to Syria, Iran, Libya, or other countries which routinely deny entry to those with evidence of travel to Israel in their passports. Gas is rather inexpensive in Egypt, prices are heavily subsidized, and they have recently fallen to under USD1.50/gallon. If you decide to rent a car, you will not add significantly to the cost through gas. Car rental sites require you to be at least 21 years old. Driving in Egypt is very different than in a Western country. It is just as easy and probably cheaper to travel by taxis and around the country by air, train, and/or bus. As you will see shortly after arrival, obedience of traffic laws is low and there are very few signs indicating road rules. Drivers frequently travel at 65mph(105km/h) on city highways,and as fast as 80mph(130km/h) or more on desert highways. Fridays cause the least amount of traffic,due to most roads in large cities being deserted for Friday prayers. The state-owned company Egyptian National Railways runs almost all trains in Egypt. The Cairo-Alexandria route is heavily travelled by train, with frequent service daily. Overnight trains are available for travel from Cairo to Luxor and Aswan, in Upper Egypt; these are run by a separate private company called Abela Egypt. On ENR trains, a First Class ticket costs only a few dollars more than a Second class ticket and you will find it much more pleasant and comfortable. Foreigners' travel is subject to security restrictions. Several websites report that foreigners are allowed to buy tickets only on selected trains. One can hop on the train into the desired class and buy tickets direct from a conductor. Note: this practice does not guarantee you the seat that you have grabbed, so even if it was empty when you occupied it, new passengers may force you out of your seat at a later stop. First Class tickets are relatively cheap and a good choice, although Second Class will more than suffice for many. The air conditioning tends to be very cold in first and second class, especially during the summer. Travellers probably won't want to experience anything below Second Class (the condition and provision of toilets, for example, drops away quickly after this level). If you must travel at a lower class due to overbooking, look for the first opportunity to "upgrade" yourself into an empty seat - you may pay a small supplement when your ticket is checked, but it's worth it. Note that toilet facilities on Egyptian trains are at best rudimentary, even in first class. Therefore, it is advisable to prepare toiletries for long journeys. Egypt has an extensive long-distance bus network, operated mostly by government-owned companies. Their names are Pullman, West Delta, Golden Arrow, Super Jet, East Delta, El Gouna, Upper Egypt Bus Co and Bedouin Bus . Popular routes are operated by more than one company. Some bus companies allow you to book seats in advance; some sell spots based upon availability of seats. In the cities, taxis are a cheap and convenient way of getting around. Although generally safe, taxis drive as erratically as all the other drivers, especially in Cairo, and you should note that sometimes fake taxis travel around. Make sure they have official markings on the dashboard or elsewhere; the taxis are always painted in special colours to identify them. In Cairo the taxis are painted white with block dotted strap around the front and rear fenders, in Luxor they are blue and white, and in Alexandria yellow and black. In Cairo and Luxor it is often much more interesting to use the taxis and a good guidebook instead of travelling around in a tour bus. Some of the taxis have meters, but most were calibrated using a law from the 1970s before the oil crisis and are never used. Seemingly, Cairo is alone in Egypt with having a sizeable population of modern metered cabs. Since Jan 2009, in Sharm El Sheikh all airport taxis have meters fitted and they must be used. Generally the best way is to ask at your hotel or someone you know from Egypt for the prices from point-to-point. You could also ask a pedestrian or policemen for the correct price. The best way to hire a taxi is to stand on the side of the road and put out a hand. You will have no trouble attracting a taxi, especially if you are obviously a Westerner. Negotiate a price and destination before getting into the car. At the end of the journey, step out of the car and make sure you have everything with you before giving the driver the payment. If the driver shouts, it's probably OK, but if he steps out of the car you almost certainly paid too little. Prices can be highly variable but examples are EGP30 from central Cairo to Giza, EGP55 for a trip inside central Cairo and EGP25 for a short hop inside the city. Note that locals pay a fraction of these prices but rarely less than EGP15; The trip from Cairo to the airport should not increase to more than 80 EGP or about 5 USD. Do not be tempted to give them more because of the economic situation; otherwise, ripping off foreigners will become more common and doing so generally tends to add to inflation. Note that the prices listed here are already slightly inflated to the level expected from tourists, not what Egyptians would normally pay. You can also hire taxis for whole days, for between EGP 200-300 if going on longer excursions such as to Saqqara and Dashur from Cairo. Inside the town they are also more than happy to wait for you (often for a small extra charge, but ask the driver), even if you will be wandering around for a few hours. Very recently, a new line of taxis owned by private companies has been introduced in Cairo as a pilot project. They are all clean and air-conditioned. The drivers are formally dressed and can converse in at least one foreign language, usually English. These cabs stand out because of their bright yellow colours. They can be hailed on the street if they are free or hired from one of their stops (including one in Tahrir square in the centre of downtown). These new cabs use current meters which count by the kilometre, which starts from 6.50 pounds. In general, they are marginally more expensive than the normal taxis; you can call 16516 in Cairo to hire a cab if you can't find them where you are looking. A ferry running between the Red Sea resort of Hurghada and Sharm-El-Sheikh used to be available with a journey time of 90 minutes for EGP400 (although it may take considerably longer in choppy seas); however, this service is not currently running. The domestic air network is fairly extensive and covers most major towns in Egypt. The national carrier, EgyptAir has the most regular services and is the easiest place to start looking before you go. They provide services from Cairo to quite a few towns and places of interest around the country, the most common being Luxor, Aswan, Abu Simbel, Hurghada, Sharm el-Sheikh, Alexandria, Marsa Matruh and Marsa Alam. The airlines previously employed two-tier pricing structure, which made fares more than four times more expensive for foreigners than locals. After the beginning of 2007, they changed to a system in which everyone pays the same fare regardless of nationality. Fares are still relatively cheap - for example a return day trip to Luxor is about USD170. It is wise to book early as flights fill up quickly in the peak season. Local travel agencies have internet web pages and can sometimes squeeze you in last minute, but it is safest to book in advance. Travellers can also check prices and book flights on EgyptAir's website, but only with Visa or Mastercard. Online ticket sales close 72 hours in advance. Travel agencies can still make bookings. The national sales call centre is unable to sell tickets over the phone, but directs you to a local travel agency; you can also ask your hotel staff about travel agencies nearby. EgyptAir has a large network of offices at strategic points around the country, which can sell you tickets. Egypt's largest private airline, Nile Air , also offer scheduled flights from Cairo and Red Sea resorts of Hurghada and Sharm el-Sheikh. Until recently it was unheard of renting car and self drive in Egypt. However now you can rent a car. Though quite expensive, you can rent Dacia (Renault) Logan in good condition and roam freely from the coast to Nile valley. Roads are in quite good condition, but some stretches are bumpy and potholes are frequent. In some parts gas stations are almost nonexistent, so fill up before heading to the desert. Eastern desert roads from Luxor to Aswan, and from Aswan to Abu Simbel are OK and fast, comparing to driving along Nile with all the traffic. Major sights (Karnak, Abu Simbel, Valley of Kings) have huge parking lots, however they are not ready for tourists coming independently, and might not let you in the parking lot (despite it being almost empty), probably thinking you are taxi and taxis are not allowed to park there. Elsewhere you will pay small parking fee (2 to 5 LE). Always ask for ticket - otherwise you will be charged again while leaving the lot. No ticket, no money - sometimes locals unrelated with parking lot ask for parking fee. Egypt is unusual in that most sites offer a hefty 50% discount for holders of the International Student Identification Card (ISIC), or the teacher equivalent. This can be significant, especially say somewhere like the Pyramids of Giza - around USD70-equivalent to enter everything, or USD35 with the card. If you are a student or teacher, it may be worthwhile to apply for one before leaving your home nation. Alexandria, with several historical sights and the stunning new Bibliotheca Alexandrina, is the country's main summer attraction for Egyptians escaping the summer heat and looking for a place to spend the summer vacation. Tourist attractions include Roman and Greek monuments, Bibliotheca Alexandria, Qa'edbay's Castle, and Qasr El Montaza (El Montaza Palace). A line of mountains and calm beautiful beaches for miles and a range of hotels to satisfy various budgets 90 min drive from Cairo for a relaxing experience with a group of friends or couples to stay there is a must. Port Said, is one of the country's main summer resorts for Egyptians escaping the summer heat and looking for a place to spend the summer vacation and to have shopping benefiting its free trade zone, Tourist attractions include the unique buildings of the city which back to the 19th century an the old lighthouse of Port Said which was the first building built in the world using reinforced concrete. In Sharm El Sheikh, you can make different types of excursions as diving, snorkelling and safari. You can also go from Sharm El Sheikh to visit Ras Mohammed, Cairo, Luxor and St. Catherine Monastery. Sporting and Recreational Clubs: If the heat is too much, you can go to one of the famous sporting clubs such as the Gezira Club located in Zamalek, or the Seid Club (otherwise known in English as the Shooting Club) located in Mohandiseen, where you can have a dip at the swimming pool or otherwise enjoy sitting in the shade and comfort of lush trees and gardens. Entrance for foreigners can be gained by buying a one-day ticket for 150 Egyptian pounds which enables the person to enjoy all the facilities of club including playing any sports. There are of course changing facilities and restaurants inside the club where one can enjoy a meal or a drink after engaging in any activity. Nile Boat: Try renting out a Feluca boat (small boat that can carry up to 20 individuals) in the Nile of Cairo. There you can experience the beauty of the Nile and the surround scenery, where you can see the city and its buildings and streets from within the water around. Depending on the weather, you can do this either day or night, but you will need to go to the Giza District and walk along the corniche area of the Nile and ask any of the locals for renting this boat. Islamic Cairo/Fatimid Cairo: For those interested in the Islamic architecture and history, try going to Islamic Cairo, ( el Gamalaya district or Khan El Khalili. There you will see numerous buildings and some mosques and see how buildings and houses were built in the Islamic Era of Egypt. There is also a souk (or bazaar) where you can buy lots of different souvenirs and items. Diving: Diving in Egypt offers a variety of diving opportunities, from shallow reefs, walls, drift dives, coral gardens and some of the most famous wrecks in the world. Here you will find unlimited options to see tropical marine life in crystal clear waters, many species of sharks, and even whale sharks. Variety is immense, and will be dependent on where you dive. Some of the most popular diving locations include diving in Sharm El Sheikh and Ras Mohammed, diving in The Gubal Strait, the wrecks at the Strait of Tiran, reef diving in Hurghada and Marsa Alam, the Abu Nuhas wreck system, and pelagic encounters at Brother Islands. The official language of Egypt is Standard Arabic. It is taught in schools and thus spoken by nearly everyone, with the exception of a small minority, mainly uneducated individuals, Bedouin, and desert dwellers. Standard Arabic is the Arabic used in official forms such as television, newspapers, government speeches, and teaching and educational institutions. It is the only common form that is understood by all the different countries of the Arab world (except Western Sahara, Mauritania and Chad). However, the native language in most of the country and the national lingua franca is Egyptian Arabic, one of the numerous (mostly mutually unintelligible) local dialects of Arabic. Although each country in the Arab world has its own dialect(s), Egyptian Arabic has the highest number of native speakers and is in fact also known as a second language by many Arabs especially in the neighbouring countries, due to the popularity of Egyptian cinema and media in the Middle East. As Egypt was a British colony until 1952, most educated locals learn English at school. Travellers are unlikely to encounter difficulties finding someone who speaks English, especially in the cities and tourist centres. In fact, English and French are taught as second languages in all public Egyptian schools, although people who go to these schools might be able to speak the language with varying degrees, depending on their education and socio-economic class (the higher having more language skills). Among the educated class, older people over 40 will generally be more fluent in French, as French was the dominant language of education in the past before English became dominant. This however, is becoming more exceptional as there are more young people going to French schools than before, so there are a number of young people who speak French as well besides English. There are also a few German schools where students are taught everything in German and following the German curriculum as well. The most other common languages are Italian, Spanish, and Russian due to the high number of tourists who come from Europe speaking these languages. Following usual rules of politeness, instead of simply starting a conversation with someone in English, ask "Do you speak English?". All the better if you can do it in Egyptian Arabic: betek-kal-lem ’engelīzi? (addressing a male) or betek-kal-limi ’engelīzi? (addressing a female). Also "ehh-ill-kallam?" -That's how Egyptians say "what's up?" In the southern parts of the country, such as Luxor and Aswan, the local language is called Sa'idi Arabic, and is different from the standard Egyptian Arabic spoken in the north of the country. There are also people Black Africans in the far south speaking the totally different Nubian language. However, basically all people can speak Egyptian Arabic and in the cities also often standard Arabic and English. Bedouins of Siwa and the western deserts of Egypt speak a language called Berber, also called Siwi, which is an unwritten language unique to them that only they can speak. These people are bilingual in Egyptian Arabic. The Bedouin tribes of other areas of Egypt have their own dialect of Arabic, which would not be normally understood by the ordinary urban Egyptian, but again these people will be bilingual in the Egyptian dialect. Contrary to the belief of some people, nobody speaks or understands Hieroglyphs (the ancient Egyptian language of the Pharaohs ) except those who studied Egyptology or work in the field of archaeology or give museum tour guides. Egypt has a perpetual shortage of small bills and change: even banks are reluctant to break too many bills. Vendors will also perpetually say they don't have change and want small bills. Hoard your small bills as much as you can, be prepared to make bank runs for change, and break your bills in the easiest situations such as large supermarkets. Coins: You won't really need to know that piastre name as the smallest value in circulation as of 2013 is 25 piastres, and this is almost always called a "quarter pound" (rob` genē ربع جنيه), and the 50 piastres, "half a pound" (noSS genē نص جنيه). The quarter, the half and the pound, are all mostly found only as coins, as of 2013. Paper money: The highest value of paper money is EGP200. Other paper banknote denominations are EGP5, 10, 20, 50 and 100.
Credit cards: Debit and credit cards are generally not accepted. Even were shops do techincally accept card payments, staff are generally untrained, and cannot therefore accept any card payments. Hotels and large supermarkets as well as shopping malls targeted at foreigners may be the exception. The Egyptian pound has been devaluing gradually over the last several decades. In the 1950s and 1960s, the Egyptian pound was rated almost the same as the British pound sterling. Since 2011, the exchange rate has become relatively unstable and inflation sped up. As of 2013, the Egyptian pound is worth about 11 times less than at its peak. As of late 2016 the Central Bank has attempted to fix the value of the Egyptian Pound to the US dollar at a rate of EGP1:USD17.7. This has led to a shortage of foreign exchange and as of December 2014 a black market in foreign currency is emerging. Dollars attract the greatest premium. Generally high street foreign exchange offices will offer the black market rate - the rates they publish are to a large extent fictional. Foreign currencies can be exchanged at exchange offices or banks, so there is no need to resort to the dodgy street money changers. Many higher-end hotels price in dollars or euros and will gladly accept them as payment, often at a premium rate over Egyptian pounds. ATMs are ubiquitous in the cities and probably the best option overall; they often offer the best rate and many foreign banks have branches in Egypt. These include Barclay's Bank, HSBC, CitiBank, NSGB, BNP Paribas, Piraeus Bank, CIB, and other local and Arab Banks. Bank hours are Sunday through Thursday, 08:30-14:00. American Express, Diners Club, MasterCard and Visa are accepted, but only bigger hotels or restaurants in Cairo and restaurants in tourist areas will readily accept credit cards as payment. Travellers cheques can be exchanged in any bank, but it could take some time. Because of the economic situation of the country nowadays with an ever-expanding population and depletion of resources, this means that a lot of people may be unemployed (a rate much higher than in more developed countries). Many who are employed in the service or hospitality industry (restaurants, hotels, bars, etc.) are most likely to be on decent salaries. This means that many people who work in the service/hospitality industry try to make their main source of income from living off of tips. Bear in mind that these people quite often live hard lives, often responsible for feeding large families and may simply barely doing such because their income from work is not sufficient for them to live easy lives. Thus, almost everyone at your hotel asks for a tip, even if all they did was a small thing. You don't have to pay huge tips as often smallest bills are appreciated. However, you do not have to tip if you feel that you haven't received any service or help at all or if you feel that the service was bad. Nobody will ever take offence or be disrespectful if you did not tip them.Note that the average Egyptian makes about 7500 EGP(405 USD)/per month. A common scam that a handful of vendors, ticket sellers, taxi drivers etc. will try is to claim that you only gave him a 10LE note, when you actually gave him a 100LE note - this can lead to a heated argument - best to treat it as an 'honest mistake' so that the vendor does not lose face, then suggest that the police or tourist police can help. As a general rule whenever giving over large bills say out loud their value so both you and the vendor know the value of the notes. When shopping in markets or dealing with street vendors, remember to haggle. Because of the downturn in tourism since the 2011 revolution, tourism is very low and you'll find shopkeepers very open to haggling and prices lower than in the past - even in places like Luxor/Aswan and not just in Cairo. You will also find many western brands all around. There are many malls in Egypt, the most common being Citystars Mall, which is the largest entertainment centre in the Middle East and Africa. You will find common western fast food restaurants such as Mcdonald's, KFC, Hardees, Pizza Hut, etc. and clothing brands such as Calvin Klein, Levi's, Michael Kors, Hugo Boss, Lacoste, Tommy Hilfiger, Armani Exchange and more. They are written from left to right. For example, the number 15 would be written as ١٥. You can also do general shopping in Cairo for clothing items and other goods such as in the modern shopping malls of City Stars, City Centre, or Nile City (all of which contain some of the most famous designer brands of the world, including Guess, Calvin Klein, Armani, Hugo Boss, Tommy Hilfiger, etc. Koshary is a famous dish, which is usually a mixture of macaroni, lentils, rice, chickpeas and tomato sauce. Very popular amongst the locals and a must try for tourists. The gratinated variation is called Taagin. Juices can be widely found in Egypt - kasab (sugar cane); erk soos (licorice); sobiia (white juice); tamr and some fresh fruit juices(almost found at same shop which offer all these kind of juices except erk soos may be which you can find another places). Stella (not artois) and Sakkara are common lager beers in Egypt (approx. 4%), both brewed by Heineken's Egyptian subsidiary, Ahram Beverages Company. Other local brands are available, most a with higher alcohol variant that have claimed levels of 8% or even 10%. Foreign brands made under license in Egypt include Heineken and Meister. The American University in Cairo (AUC),  is the the best school in the country and offers degree, non-degree and summer school study options. Popular courses include Arabic Language and Literature, Islamic Art and Architecture, Arab History and Culture, and, of course, Egyptology. There are a number of options for learning Arabic in Cairo, including the Arabic Language Institute , Kalimat  and International Language Institute. Travelers often complain about being scammed in Egypt. While irritating, most of this is harmless attempts to lure you into a papyrus or perfume shop. Typically, you will be approached by a man speaking fluent English who will invite you to join him for a cup of tea at his favorite souvenir shop where he will make you pay. If you are hassled, say la shukran (no thanks) or halass (enough). If you let yourself be bugged by everyone trying to sell you something, your holiday won't be a very happy one. You'll typically also get the "do you remember me? I work in your hotel and saw you this morning" scam as well where the guy will try to lead you to a shop or restaurant where he gets commissions. Tell him he is mistaken and walk away. Touts will tell you to put money into a donation box in a mosque claiming that it will help the neighborhood that recently had an earthquake. Just ignore him. More annoying are taxi drivers who get commission from hotels they drop you off at. Just ask to be dropped off at a street or landmark close to the place you are heading to. Egypt has generally been a safe country to travel to, people are friendly and willing to help. After a long period of political stability in a dictatorial climate under President Mubarak, Egypt is now politically unrestful. Terrorism is a safety concern, but the odds of being affected by terrorism are statistically low and any shady areas may have extra security. There are also many patrolling police officers armed with AK-47s riding on camels in the Giza plateau. They ensure the safety of the tourists since the Pyramids are the crown jewels of all the Egyptian antiquities. Some tourists may want to take pictures with these police officers on camel back, but while on patrol they may verbally warn you not to pose next to them in order to take a picture with them. Pickpocketing is a problem in Egypt's bigger cities, particularly Cairo. You should keep your money in a clip in your pocket like the locals do. Violent crime is rare, and it's highly unlikely that you will be mugged or robbed. If you do find yourself the victim of crime, you may get support of local pedestrians by shouting "Harami" (Criminal) while chasing the person who robbed you. Overall, scams are the main concern in Egypt. Egyptians who starts a conversation with you in Cairo and Luxor may "befriend" you and be a guide for you, even bring you back to their place for dinner, and then they will demand money for it. Basically, if it seems too good to be true, it probably is. Demand prices for absolutely everything. A scam at amusement parks is they will pretend to be your friend by treating you, then offer to hold your belongings when you go for a ride only to disappear afterwards. Keep in mind that most Egyptian workers expect tips after performing a service, known as Baksheesh. This can be expected for something as little as pressing the button in the elevator. Many workers will even ask you to tip them before you get a chance. The typical tip for minor services is 50pt to 1 LE. Due to the general shortage of small change, you may be forced to give 5 LE to do simple things like use the bathroom. Just understand that this is part of the culture. Do not elicit any conversations about politics, but don't be afraid to partake if a local you are speaking with (typically a middle-class and well educated shopkeeper) begins a rant about his hatred for the current administration (for whom they blame, rightly or wrongly, for the drop in tourism and economic loss). This will be a common theme that you'll find many of the friendly locals go into, but certainly you don't want to be seen as a foreigner coming in to insult their government with knowledge of only what you hear in the media. Egyptians are generally a conservative people and many are religious and dress very conservatively. Although they accommodate foreigners being dressed a lot more skimpily, it is prudent not dress provocatively, if only to avoid having people stare at you. It is best to wear pants or jeans instead of shorts as only tourists wear these. In modern nightclubs, restaurants, hotels and bars in Cairo, Alexandria and other tourist destinations you'll find the dress code to be much less restrictive. Official or social functions and smart restaurants usually require more formal wear. At the Giza Pyramids and other such places during the hot summer months, short sleeve tops and even sleeveless tops are acceptable for women (especially when traveling with a tour group). Though you should carry a scarf or something to cover up more while traveling to/from the tourist destination. Also, it's perfectly acceptable for women to wear tall boots during the summer, and you will even see some women with the hijab who have tall beautiful boots on. Even in Cairo, dryers are extremely rare, but they aren't exactly necessary: The combination of the Egyptian climate and a clothesline will do the job. Don't hang any white fabrics up outside, the dust will turn them yellow.